Review by AllTheBestFights.com: 2016-02-13, Fernando Carcamo vs Daniel Echeverria gets three stars thanks to a good finish. Daniel Echeverria entered this fight with a boxing record of 19-1-0 (17 KOs=89%) and he is ranked as the No.31 welterweight in the world while his opponent, Fernando Carcamo, has an official record of 20-6-0 (15 KOs=75%). 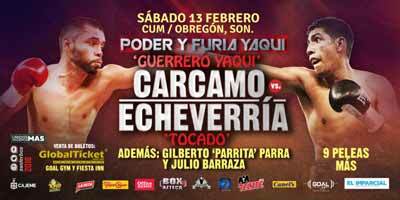 Echeverria fought four times last year losing once, against Jorge Paez Jr (=Echeverria vs Paez Jr), while Carcamo suffered his last defeat in 2014 when he faced Petr Petrov (=Carcamo vs Petrov), after this bout he has won three consecutive fights. Echeverria vs Carcamo is the main event of the evening. Watch the video and rate this fight!